Cover crops in row middles are grown to maximum height prior to rolling. Ed James has citrus in his veins. He has been working and thriving in the citrus business since he was a teenager — from hoeing orange trees to owning a caretaking business that serviced thousands of acres. That is, until about eight years ago. In 2010, James looked around his personal 45-acre citrus grove and realized it was time to throw in the towel. The citrus industry in Florida had gone from over 800,000 acres to less than 400,000 acres. Citrus greening was the main culprit, but there were other factors for the decline. For James, it had just become completely unprofitable. The trees looked stunted and almost dead from foot rot, Diaprepes root weevil and HLB. After deciding to give up on his grove, he began pushing out all his trees. His plan was to plant cover crops and get the soil ready for watermelons or other row crops. However, the front-end loader broke down midway through tree removal. He decided to just leave those trees until he could fix the loader. He planted cover crops down the rows to keep the plan moving. What remained were Hamlins, a cultivar notoriously susceptible to greening, and some Navels. Based on University of Florida Institute of Food and Agricultural Sciences (UF/IFAS) research by Danielle Treadwell and others, James determined that a mix of five types of cover crop plants should speed up the process of improving soil health. Treadwell’s research indicated that a mix of at least three families of plants, but no more than five, are needed for soil health. To get the diversity of root exudates that would bring the soil back to life after so many years of being planted in citrus, James decided on a mix of cereals, grasses, legumes, brassicas and broadleafs. He compares the importance of microbiota of soil to trees to people’s gut microbes in being essential for health of the overall system. Microbiota in the soil needs to be promoted with careful selection of cover crops, while also avoiding fertilizer salt buildup and ceasing activities that disturb the soil (e.g., tilling or disking). Herbicides should be limited, with ground cover controlled preferentially by mowing or crimping. James’ last three years of experience with cover crops reflects many of Treadwell’s research results. His field has gone from having a negligible amount of organic matter, which is typical of sandy ridge soils, to having at least 3 percent organic matter. James’ first attempt at growing cover crops was largely a failure, with only a few seeds growing in the aisles. Plants that did grow were stunted and looked “hungry.” He decided to apply compost before planting his next cover crop. This addition helped, and the cover crop plants looked better with each successive planting. As James progressed with his plan, he noticed something about his citrus trees: They started to look healthier, with improved leaf color and less fruit drop than in previous years. After seeing his trees make such an improvement, James decided to keep those last few rows of trees and begin the process of actively managing cover crops within the trees, while refining his techniques along the way. He has been doing this for eight years now, and the trees look healthy despite some greening symptoms and the presence of Asian citrus psyllids at low densities. James’ recent harvests have been promising. Fruit on the trees “hang on” and mature, and his yields have increased every year since he has begun the cover crop program. 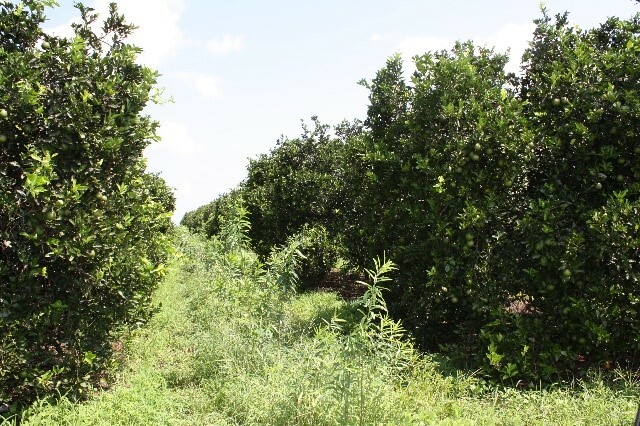 The trees in his groves are small compared to the trees he grew before citrus greening became widespread, but those that remain are profitable despite his decrease in production acreage from years ago. It took three to four years to rehabilitate his field to this point. There were many things James learned along the way as he tried various methods to improve the cover crops. He believes using cover crops is an art as much as a science. He learned that microbial inoculants helped, whether in the form of compost tea, compost as a soil additive or commercial products with specific microbes. Rather than disking or tilling cover crops, he modified old equipment to make a roller-crimper. This tool crimps the stems of the plants in the row middles as it rolls over, killing the plants while leaving behind plant residue that will break down to become part of the soil. James now plants three cover crop mixes per year — two in the summer and one in the winter. Mixes are directly seeded into the previous crop, and periodically the row middles are cut with a mower that throws the plant material underneath trees, where it acts as a mulch. Tall plantings like sunn hemp are cut back using a sickle bar mower, which lowers herbicide use underneath trees and reduces the herbicide band to a 2- to 3-foot-wide strip. Paraquat is used as needed to kill back plants under the trees before harvest to aid in picking. Glyphosate is only used to spot treat problem areas. James tries to always have something flowering to provide beneficial insect habitat, so he does not terminate all the cover crops at once. The selection of cover crops is important in developing a strong soil biology. James does not plant sorghums or big millet, preferring to plant annuals that will die every year. Vining legumes are also avoided because they climb trees, creating a challenge for harvest and shading out the canopy, which can reduce the photosynthetic activity of the trees. His summer mixes include hairy indigo, brown top millet, buckwheat, Alyce clover, Peredovik sunflower and sunn hemp. In the winter, he uses Daikon radish, mustard, oats, rye, barley and crimson clover (reseeding type). 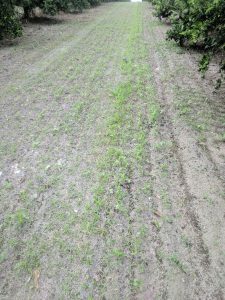 Many of the cover crops James uses are also used for wildlife food plots. Birds such as doves are attracted to his grove, which he considers a bonus. James still uses inputs like fertilizer and microbial inoculants. Fertilizer is applied based on leaf and soil analysis. He applies fertilizer through irrigation injection, along with a carbon source like humic acid to help hold the fertilizer in the soil. With more organic matter in his soil now, there is carbon in the soil and he has reduced how much humic acid he applies. He says his soil will always need supplemental potassium and micronutrients as they are removed with each crop. He likes to include small amounts of minerals that he gets from kelp or sea minerals. After eight years, James found his leaf and soil analysis indicated he needed 75 percent less nitrogen, so he was able to reduce his fertilizer input. This is likely because organic matter from cover crops can increase the cation exchange capacity of the soil, which makes it hold onto fertilizer and nitrogen. Working with a cover crop system is not for neat freaks. Cover crops can get tall and appear out of control. James never lets them get too high under the tree and sickle bars as needed. Row middles are rarely mown because the plants die back annually. Roots of the cover crop plants grow down and incorporate organic matter into the soil, so tilling of the soil is not necessary. From his experiences, James believes that growing his own organic matter is much cheaper and easier than adding compost. His cover crop system can be challenging for young trees. Growers using this system with young trees will have to stay vigilant to keep the cover crops from competing with trees. James is on a mission to educate citrus growers on the advantages of both the use of cover crops and creating a healthy soil biology. He uses his own grove to teach growers the benefits of cover crops, and others are now trying it out. Juanita Popenoe is a multi-county commercial fruit Extension agent at the UF/IFAS Lake County Extension office in Tavares. Lauren Diepenbrock is an assistant professor at the UF/IFAS Citrus Research and Education Center in Lake Alfred.